CPAP Filters – The filters should definitely be on your list of necessary CPAP comfort accessories. The filters are ideal if you are prone to allergies. They provide ultra-clean air in the mask. Furthermore, the filters provide extra air filtration and eliminate all harmful bacterias that can cause additional breathing problems. For optimal performance, change the filters regularly. CPAP Mask Cleaning Wipes – Your collection of CPAP comfort accessories should include cleaning wipes. You should clean your mask with clean wipes on a regular basis. The wipes are made from natural ingredients and are convenient for use every single day. You don’t have to rinse the mask after you clean it with a wipe. Simply remove all the dust and dirt from the mask and leave it to dry for a few seconds. CPAP Cleaning Solution – Regular maintenance of your CPAP machine is a must. A simple cleaning procedure is all that is needed for effective results. You can buy a CPAP disinfectant to kill all the bacterias inside. This solution can be used to clean the tubes and the CPAP mask. 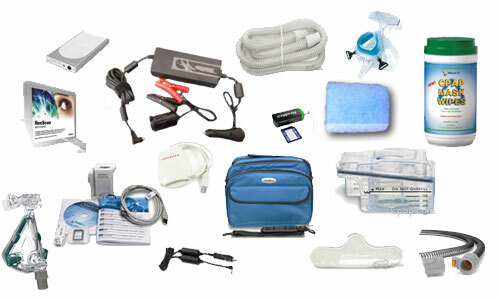 This CPAP cleaning solution is regarded as one of the most important CPAP comfort accessories. Humidifier – Some sleep apnea patients experience dry nasal passages and dry throat from the CPAP therapy. That’s because the air is too dry. A lack of moisture might reduce the effectiveness of the CPAP therapy and cause additional problem in the breathing process. For that reason, the manufacturers have developed a humidifier. This CPAP accessory moisturizes the air and helps patients to breath easily during the night.